Final day and a lot more little things to polish than I expected. Every time I got something fixed another problem would pop up. We got everything in a good state for E3 but there are quite a few more ideas we want to try for the castle visuals, probably 2 or 3 more days of work . Fun to speculate, though. :) Looking forward to reading a few articles on the game, hopefully. It’s looking beautiful! Thank you for the many hours of hard work you’ve put into this game! Hey in case the comments don’t reflect it, I really appreciate all these posts and photos. This blog has been very slow lately (no doubt for how busy you all are). I check your blog everyday and grow ever more excited when I see new posts. This is the one game that I have been dying to play ever since I heard it was coming to PS4 and PC. I’m a huge fan of Braid so no doubt this game will fulfill my puzzle cravings after I played Braid. Keep up the awesome work! That is simply impressive. Can’t wait (literally) to play it. I only watched Sony’s E3 presentation hoping to find something about The Witness, but it wasn’t this time. Even though, I hope you keep us updated with the development. Can’t wait. Just can’t wait. So, um, what happened with E3, Jonathan? I think there were a couple others, too. Yeah, but I’d rather not hear it in the streets. I’d rather Dad told me. By the way, it’s amazing to me that, considering the scope of this game, this blog isn’t flooded with participants. Odd, that …. I know the game is yet to be out — but after watching quite a few talks by Jonathan, following its progress over the years, I just want to say I really appreciate the underlying philosophy and drive that “games” are part of our visual and intellectual culture and history, that we’re responsible for what we develop and put out there. To put effort into something really crafted, that respects the player, that tightly considers the aesthetics, that encourages play and learning to discover insight — it’s just phenomenal, it’s this kind of creative work this age needs and it will inspire and enrich generations forward to work in a whole new medium besides what we traditionally understand in the arts. Couldn’t find The Witness at E3. So sad. Was a fun show though. Learned about Starwhal and The Talos Principle which both look great. Is there going to be a new trailer at some point? Jon mentioned a trailer a while ago on twitter, not sure if he meant the one we’ve already seen though. Such a bummer, I was looking all over E3 for The Witness. I wonder what happened? I was really looking forward to giving it a shot. Any news as of late? We were not showing publicly at E3, just behind closed doors. What was the reason behind keeping it on the low down (down low…no doubt)? I figured you would want to draw in more interest seeing as it was announced as a PS4 launch game. Was that your intention to stay behind closed doors or were they giving you the shaft? I just don’t want players playing the game until it is done or basically done. Why give people who are excited about it the incomplete / bad version of the experience? With Braid, not only did the design of the game and the look and feel of the world feel engaging but it was the music that really grabbed me. I’ve been eagerly wondering what your choices are going to be for this game and wondered if you were going to be talking about that at all within these posts. The music choice in the trailer released last E3 was spell binding. I think I’ve watched it too many times to count because it feels me with a different emotion each time. If that song is any indication of your direction for the rest of the game I’m sure I’ll be mesmerized from start to finish. Hopefully you can shed some light on the music direction sometime for us. So E3 came and went. Did you guys finish everything you intended? How did it go? So when will it be released exactly? The game actually does not have any ambient background music, instead focusing on naturalistic environmental sound. So you can expect to only hear the sounds that you would actually hear if you were in the type of environment that you are in. In other words, you will only hear grass rustling if there is grass rustling nearby. Perhaps there may be music in the game, but it would have to be coming out of some speaker in the environment. And it would have to have a good reason to be there beyond just setting a mood. And as a random trivia, the game has over 1,000 footstep sounds. Ugh, always gets me the reCAPTCHA fail reply bug. So that reply was intended @David Reid. Kinda slow with the blog updates lately, especially when you consider E3 just ended. Thier should be a veritable plethoric flood of data coming through now at this point. Like, since by the time this is released, iOS 8 will be in full swing. iOS 8 allows public beta testing of apps. 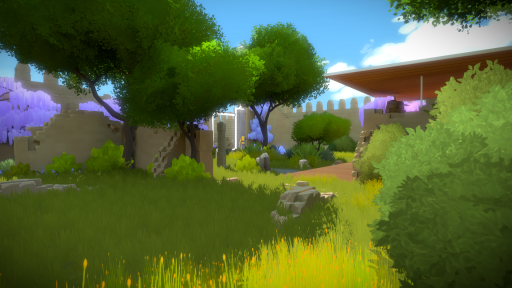 Will “The Witness” be beta tested? If so, how do you enter the lottery to be among the lucky chosen few? I wouldn’t be surprised if iOS 10 was out before The Witness! I am also a little weirded out that I can only find a couple interviews with Jonathan from E3. From what I understand I have learned of two things, A: Jon’s hair looks good grown out, and B: The target is now the end of the year rather than the middle… which is long gone. Oh well. I wish people never pressured developers for release dates, because they always make something up way off mark to satiate the fans! Another short interview with some gameplay footage (spoilers). Much in the same way one may arrive at a more finely granulated measure of Irradiance, I’m staring at this image, trying to intuit how to arrive at an aesthetically meaningful calculation of overall ‘interestingness’ for any given scene, from a given (playable) vantage point. Such a measurement would, eg. take in overall number of light sources, average object density, color field complexity, etc. and generate a ‘heat map of visual interest’. It might also place tiny virtual cameras around the island for a Dev to look through, in order to view poorly composed (designed) scenes – much in the same way coin operated telescopes are placed in certain key tourist hot spots of Visual Interest.